Bridge-repair may include different methods. They cover a great variety of materials and building techniques. It should not escape the attention of keen observers with an artistic eye that Bridges are often works of art to be admired for their harmonious lines blending smoothly in the landscape and for the impact of their beauty in the minds of sensitive people. In this exposition however the presentation will be limited only to fabrications by welded metallic materials. Safety impairment is determined by professional inspection. Bridge-repair by welding should be properly addressed to restore to safe condition originally welded constructions. Except that even cast iron constructions may occasionally need local weld repair if damaged. Welded Fabrications imply that the base materials are weldable, although with special precautions if needed. It is reported in the press that large numbers of bridges, especially those with decades of service, are in need of immediate attention, which is lacking or insufficient because of limited budgeting. A new edition of the Bridge Welding Code was announced (2) in Issue 152 of Practical Welding Letter for April 2016. Countries other than the USA may have issued different binding documents covering requirements and responsibilities relative to building and maintaining bridges in their territory. 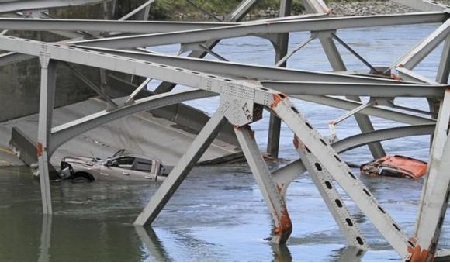 Safety considerations are generally the most compelling reasons for requiring Bridge-repair. The initiation and growth of cracks under cyclic loading conditions, known as fatigue, is the most severe danger that may impair the functionality of sustaining members, and may even cause sudden collapse if not detected in time. Therefore large efforts are dedicated, during scheduled maintenance review of bridge structures, to the search of tiny cracks in need of monitoring and repair as soon as possible. Crack detection is performed by non destructive visual methods on clean surfaces prepared for the purpose. The two most common methods of crack detection for regular monitoring of bridge safety condition are based on Magnetic Particle Inspection or on Liquid Penetrants. For more information see Welding Inspection. Although the techniques are simple in principle, the practical application is trusted to trained and expert Inspectors that should have followed formal courses, gained experience in actual applications and passed a formal and a practical test. Any suspected indication of discontinuity should be evaluated by an experienced professional for disposal of further action. In very cold weather, materials resistance to sudden impacts may be severely limited relative to that at normal ambient temperatures. Other harmful conditions to be reported are corrosion attacks, due to insufficient surface protection by means of protective paint or by other means, or deformation due to local impact during occasional accidents. While there is no substitute to professional inspection of the present condition of welded structures like bridges, advanced means were developed for continuous monitoring of complex structures, as previously remarked in our past publications hereafter. It was reported in the July 2005 issue of PWL in section 9.6 on a TWI developed Crack Sensor capable of alerting maintenance personnel of impending danger. See PWL#023. An Article on Fiber Optic Sensor Technology was published in section 7 of the December 2006 issue of PWL. See PWL#040. Bridge-repair may be needed for old steel constructions, in which case it may be difficult to find reliable sources describing the materials used. Then every effort must be done to identify the base metal type and condition, in order to specify correct repair methods including preparation, preheating, filler materials, welding procedure specifications and post weld heat treatment if required. With the continuous development of new steels with improved properties, bridge fabricators strived to make good use of available characteristics for decreasing the structural weight while assuring the required load capacity. In our page on Electroslag Welding, we reviewed shortly the Moratorium that was enforced temporarily on the applicability of this process for building bridges. The limitations were eventually removed from the current Code while introducing specific impact strength requirements for different environmental situations. Duplex Stainless Steels (see PWL#121 and PWL#122) were used also for building bridges. Should Bridge-repair be needed for structures of these materials, the welding procedures should be carefully studied to be suitable to the requirements of their metallurgical buildup. A short exposition on Welding of High Performance Steels for Bridges is published in the AWS Welding Handbook, Ninth Edition, Volume 4 - Materials and Application, Part 1 at page 83, in Chapter 1, dealing with Carbon and Low-alloy Steels. The main characteristics of these material, consisting in higher strength and toughness, are briefly reviewed there as permitting less weight, greater spans, more flexibility in design and lower overall costs. Welding requirements include the use of low hydrogen electrodes and limiting heat input. The same Handbook volume quoted above, in Chapter 9, on Maintenance and Repair Welding, details how to establish repair welding procedures (page 583). Interested readers could benefit by reviewing the recommendation and by following the check list included. Most of the existing bridges are probably unique in design and construction. Therefore it should not come as a surprise that Bridge-repair Procedures should be uniquely designed to their specific object. The professional know-how and the specific experience of the individuals in charge of bringing about Bridge-repair are the best assurance that their task will be accomplished to the highest standards. The recent Bulletin_104 lists links to Online Resources on Bridge Maintenance and Repair, reachable with the click of the mouse on this link. We are informed that publishing a list of internal links in website pages, is judged as objectionable practice by companies that grade the relevance of the page content to users' usefulness. Therefore, in an effort to comply with the above requirement, we remove the usual list appearing in this location, and urge our readers to use the Site Map to locate the pages that might provide them the answers to their questions.